Hollywood, a land of imagination and dreams, where anyone’s star can rise and fall…and where the best actors and actresses ever portrayed characters of all kinds, including private eyes, cops, and other mystery solvers… But what if the stars from the Golden Age of Celluloid actually ended up investigating real crimes, finding themselves in the crosshairs of danger while pursuing murderers and criminals through the studios and back alleys of America’s Dream Factory? 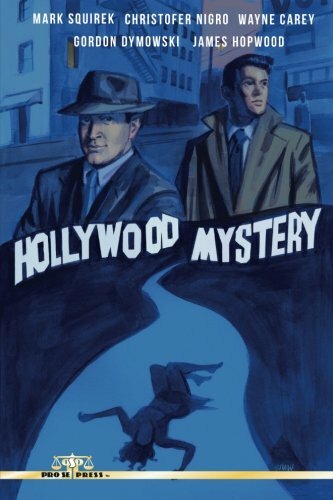 HOLLYWOOD MYSTERY is a collection of stories written by Mark Squirek, James Hopwood, Christofer Nigro, Wayne Carey, and Gordon Dymowski turning beloved Hollywood icons into detectives, looking under every rock and following every blood trail, hunting for the truth and hoping not to end up on the cutting room floor! HOLLYWOOD MYSTERY. From Pro Se Productions. With an evocative cover and logo design by Adam Shaw and print formatting by Marzia Marina and Antonino Lo Iacono, HOLLYWOOD MYSTERY is available now at Amazon at https://www.amazon.com/Hollywood-Mystery-Mark-Squirek/dp/1546355677/ref=sr_1_2?ie=UTF8&qid=1494269759&sr=8-2&keywords=Hollywood+Mystery+Squirek and Pro Se’s own store at www.prose-press.com for 15.00. This unique mystery collection is also available as an Ebook, designed and formatted by Iacono and Marina for only $2.99 for the Kindle at https://www.amazon.com/Hollywood-Mystery-Mark-Squirek/dp/1546355677/ref=sr_1_2?ie=UTF8&qid=1494269759&sr=8-2&keywords=Hollywood+Mystery+Squirek and for most digital formats via Smashwords at https://www.smashwords.com/books/view/722841. FOR IMMEDIATE RELEASE DISCOVER ACTION AND ADVENTURE-‘EXPLORER PULP’ DEBUTS! DEATH DEFYING OCCULT ADVENTURERS! ‘WALKERS IN SHADOW’ DEBUTS!